Maghull Coaches has always been run with a passion and love for the business. It was started by partners Kevin Reilly and Carole Reilly nearly 50 years ago, with one single coach parked outside their home in Maghull. With the business phone in their home, they started their small business and both took on the driving, cleaning, mechanical, clerical duties (the whole lot!) by themselves, before eventually having to hire a secretary and some extra drivers. Kevin and Carole slowly built up the company over the years, taking on more drivers, renting space to store the growing number of vehicles, and even taking on their own maintenance premises and staff. 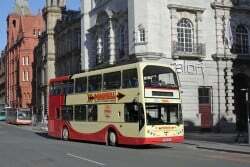 Maghull Coaches went from a small business, and slowly became the big company it is today and are now daily undertaking a huge variety of work that the founders couldn’t imagine, private hire, school & college contracts, council contracts, wedding coach hire, open top tours of our wonderful city of Liverpool. Keeping the company family-run, son and daughters (Joe, Ann and Stephanie) have gained their Operator’s CPC qualification and taken on roles to build on the strength of Maghull Coaches and keep that personal ‘tender loving care’ touch to the service provided.